A complete remodel to our kitchen, including removing all cabinets, appliances, flooring and paint. A kitchen remodel can be the most stressful of all home improvement projects and can run into any number of problems. Le Gourmet represented the very best you could ever expect in design and construction. 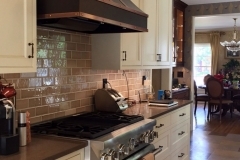 They worked closely with us during design and their ideas met or exceeded our expectations for the new kitchen. During construction, they met their timeline and every aspect of the project with few small problems and no major problems. Their follow-up was immediate and they were always available to answer questions or fix an issue. The contractors they use are craftsman and care about the quality of their work. I would never hesitate to use them again for another project. The above review was written upon completion of the project in 2013. 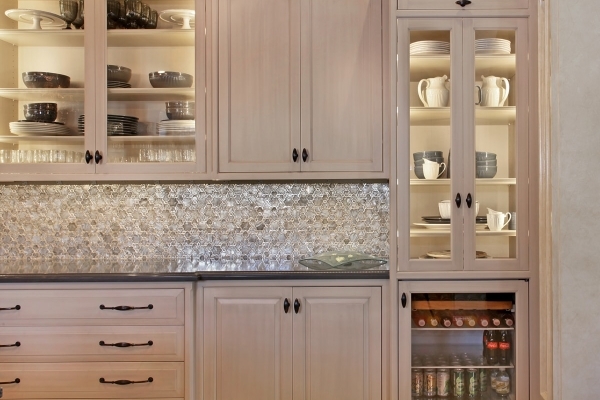 It is now 2015 and we love the kitchen even more! It’s layout is perfect and as beautiful as the day it was completed. Bruce and Le Gourmet Kitchen did a wonderful remodel from the studs on out. Neighbors still come over to see the kitchen, not believing that it is the same footprint as their kitchens yet beautiful and functional. The banquette, built-in bookcase and pantry are the highlights. The under-counter microwave was a perfect addition to allow the counter to be extended. The 6-drawer island holds all of my bake ware and is a wonderful work station. I’d recommend them in a heartbeat! Fantastic! Le Gourmet Kitchen provided excellent service. 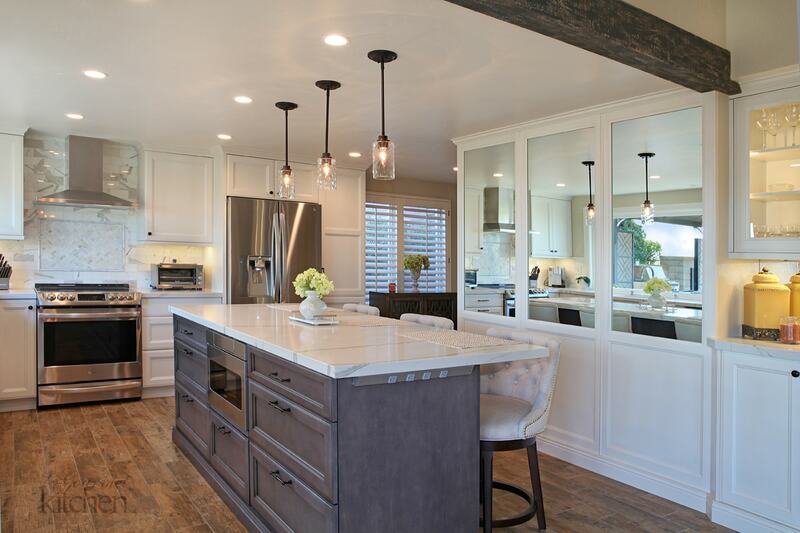 They did an amazing job on both the design and remodel of my kitchen, and they were a pleasure to work with. I couldn’t be happier or recommend them more highly. 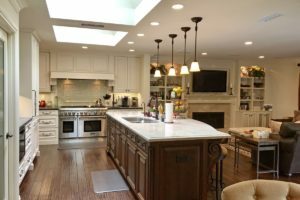 We hired Le Gourmet Kitchen to do a complete remodel of our kitchen. Bruce listened to us as we described how we used the space – we entertained quite often; he accommodated our needs and made sure everyone was on the same page. He frequently visited our home to make sure we were happy with the progress. 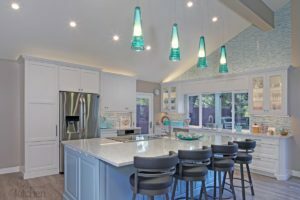 So much could have gone wrong, given the nature of the remodel with the finishes, lighting, flooring, cabinetry, and hardware that were used. However, everything came out perfect and beautiful and within the time frame promised and budget. Considering my Bachelor’s degree is in Interior Design, I’m glad I hired Bruce as my kitchen designer – I would hire him again in a minute! We love our new kitchen! Bruce took the time to review every last detail of our remodel to create the perfect kitchen for us. 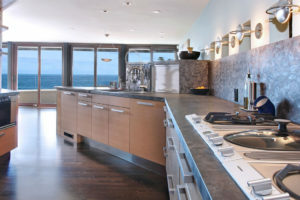 From the design, appliances, plumbing, counter and back splash materials, island detail, lighting, hood, sink, cabinet style and even the color of the walls, he was there every step of the way. He even designed a beautiful coffered ceiling! Bruce provided professional guidance and was also fun to work with. We are very happy and recommend Bruce Colucci and Le Gourmet Kitchen highly. Professional, courteous, on time, on budget. After 11 years, all as good as new. Long after he was paid in full. Very unusual in this business. We absolutely love our kitchen designed by Le Gourmet. Johnathan spent many hours helping us refine our plans to meet our needs and include professional design touches too. All the work was done so professionally by some talented individuals who really know their stuff. 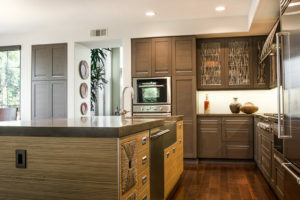 We were first introduced to Bruce Colucci of Le Gourmet Kitchen through his work – admiring the kitchen he had designed for a house we considered buying in Irvine. We didn’t buy that house, but we did meet with Bruce and – duly impressed – commissioned him to remodel the kitchen and master bathroom of the house we eventually bought. Working with Bruce has been a very positive experience. He is very passionate about his work, is knowledgeable about all aspects of construction and design, and has very high standards. A man of many talents, he also proved to be a very good manager of all the elements of the project – from contractor personnel to product suppliers. Overall, we have also been impressed with the quality of contractors selected to complete various elements of the remodeling projects. They have demonstrated themselves to be talented, professional, respectful, and creative problem solvers when necessary. And when snags were encountered in some aspect of the project, Bruce responded quickly to work out reasonable and cost-effective solutions with diplomatic flair. 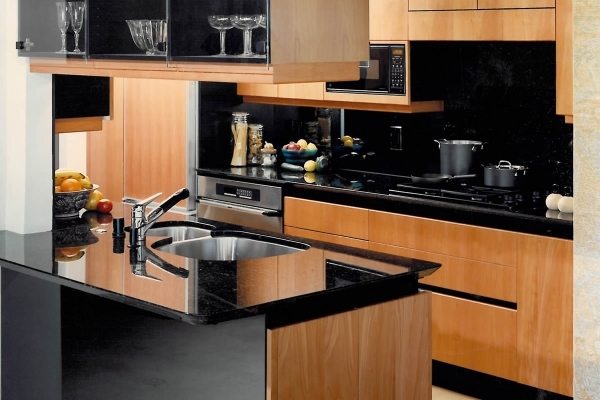 If you are in the market to remodel your kitchen, Bruce is the first person you should call. We can’t recommend him highly enough. Le Gourmet Kitchen recently finished a kitchen remodel for us and we are so very pleased with the final product they have produced in our home. Our kitchen was not so much remodeled as transformed. We just love both the look and functionality. And the quality is most definitely first rate. Our installer was a craftsman and a true master at his trade. A few minor course corrections notwithstanding along the way, the process was prompt, professional, and always customer service oriented – repeatedly going the extra mile to make sure the end result was perfect. Jonathan Salmon and his team were a pleasure to work with. From inception to the finished result the process was efficient and painless. And the attention to detail was amazing. 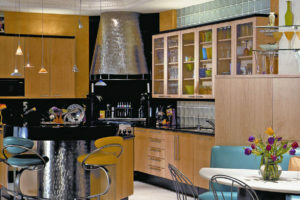 Last year, Jonathan Salmon at Le Gourmet Kitchen Ltd., designed a beautiful kitchen that we enjoy every day. We had looked forever for a design that was elegant and yet functional. We had bids from other designers, but the kitchen remained a small, uninspiring area. Jonathan’s design included moving a wall, appliances (Blue Star range top, a fabulous Miele dishwasher that I adore). 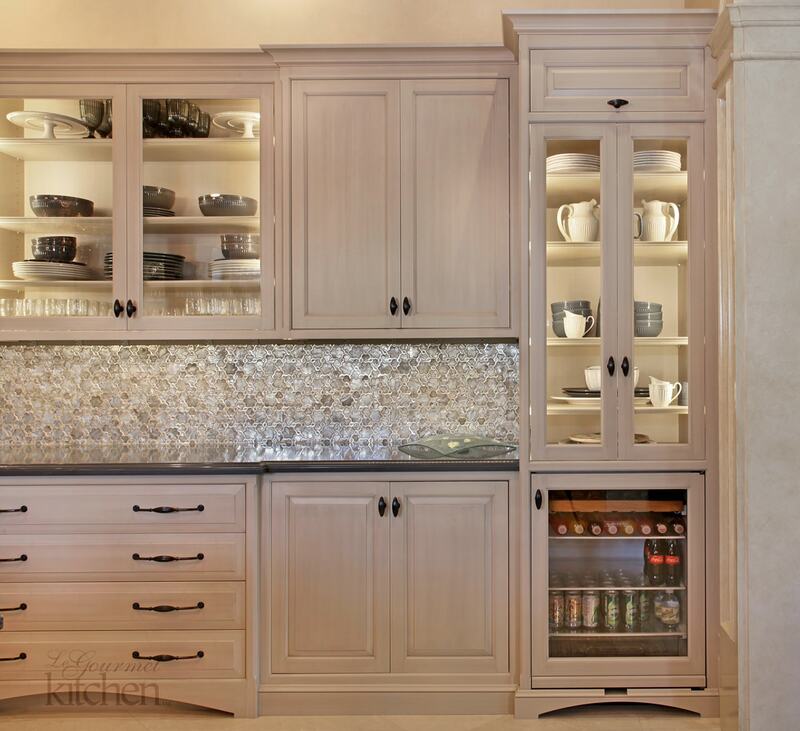 Beautiful cabinets that utilize the corners, providing us more storage space. I love our Kohler sink with its accessories (who knew!). The counter top sets the entire mood for the kitchen which is spacious and beautiful. He also recommended a garden window that affords us so much more light and an area to display flowers or plants. Our friends have raved over the change . Truly, every morning we love walking into our lovely, spacious area. We recommend Jonathan Salmon at Le Gourmet Kitchen Ltd.
It’s been over two years since my total kitchen renovation, I don’t have any regrets. Jonathan was creative, handy, all his measurements were very precise, and all my wishes were met. The most amazing effect is the kitchen area seemed to have expanded with all the appliances and fancy pull-outs being incorporated in it. I am glad that I hired someone who is more of a perfectionist than I am. 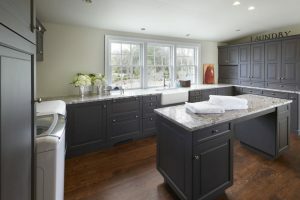 We collaborated with Le Gourmet to remodel our kitchen and couldn’t be happier with the results! My husband and I had an idea of what we wanted and Bruce was able to visualize our wishes on paper to create our dream kitchen. His skill and creativity made simple work of our remodel. 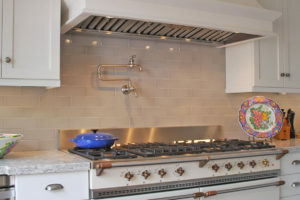 Le Gourmet was able to work within our budget to help us design a beautiful, functional kitchen. We could not have done it without him! We are so happy we chose Le Gourmet Kitchen! I had compiled my “dream kitchen” wish book and showed it to Bruce when we were in the beginning stages of our kitchen remodel. Bruce took my dreams and with his amazing designer talents captured exactly what my husband and I envisioned plus some! He is an amazing designer! He has the experience and an eye for creativity, functionality, and he listens to that which is important to you. Once his and our vision were captured on blueprints, including beautifully done colored drawings of our future kitchen, he went to work to oversee our project. He is very knowledgeable when it comes to kitchen appliances, granite, tile, cabinets, lighting down to fixtures, knobs and the magic corner! Ask him about that because it really is special and space efficient. The lighting he set up in our kitchen and family room is brilliant! We love the graphic eye he recommended we install. Let me say this though, kitchen remodels are not for the weak! Factor in that 10-20% budget overage and expect delays. What I knew for certain is I could contact Bruce and he was going to make it happen and most importantly make me happy. I am detail oriented and so is Bruce so this was a very successful, often stressful, beautifully designed, highly functional kitchen project that was and still remains a happy ending. And, my husband and I are still remain friends with Bruce and visit from time to time. 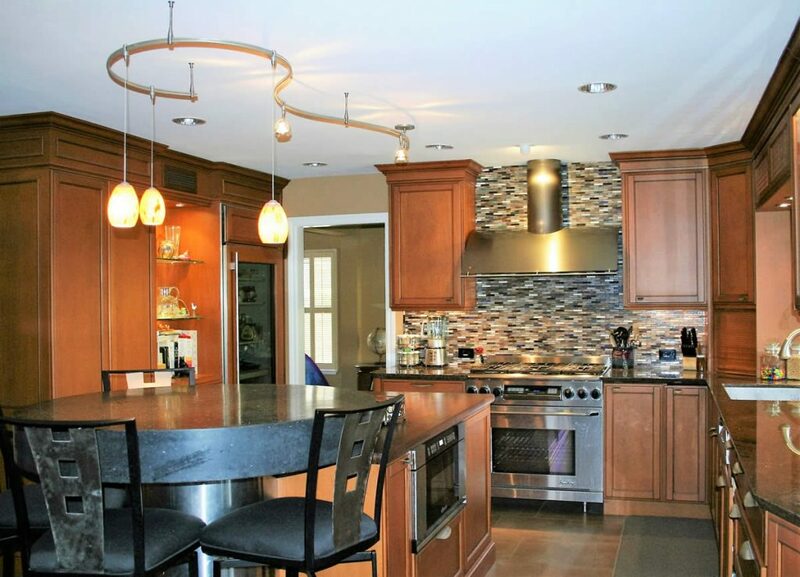 Bruce Colucci of Le Gourmet Kitchen Ltd. is extremely knowledgeable and passionate about kitchen design. We loved his ideas and ability to make a beautiful design while maximizing a wall of windows, over looking our backyard! Another added bonus is the attention to lighting design and detail. We absolutely love our kitchen. 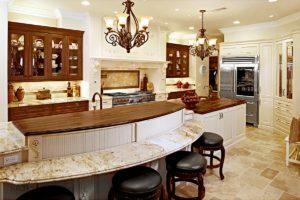 After talking with several other kitchen design and remodeling companies, we selected Le Gourmet Kitchens and owner / designer Bruce Colucci. No one else invested themselves so wholeheartedly in our dream kitchen project. My wife and I agreed that the design he created for our kitchen was pure genius, and really beautiful. 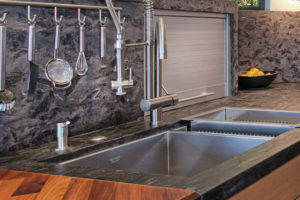 Bruce improved our vision by asking good questions, making suggestions for alternatives to consider, and helping us to navigate all the trade-offs that are part of a good kitchen design. During construction, Bruce remained engaged, and was flexible when we requested some minor changes. The design maximized our limited space and resulted in a modern, highly functional and elegant cooking space that continues to be a source of pride for us. Now, four years later, we are still very happy with our decisions and enjoy continued praise from our friends. 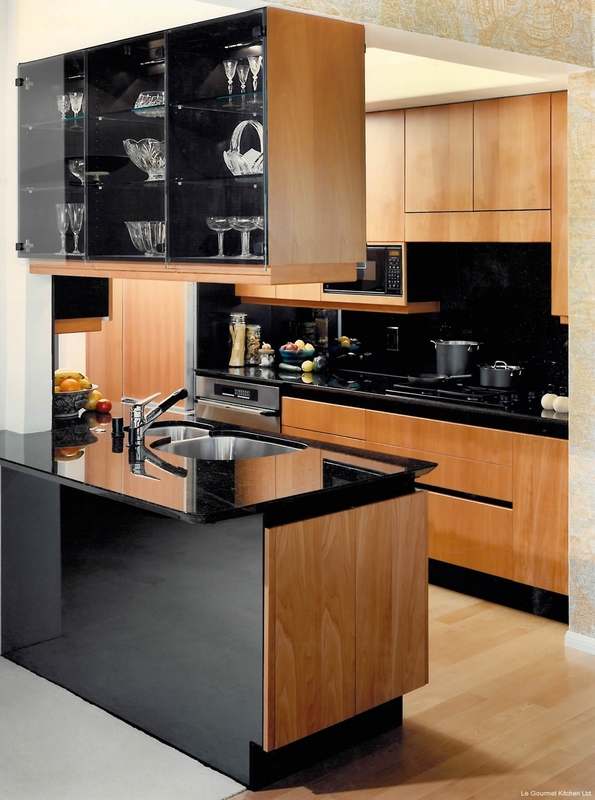 A kitchen project is not a trivial undertaking. To get it right, it is important to hire the most talented professional services available. If someday we decide to move and want to build another great kitchen, I would hire Bruce again. 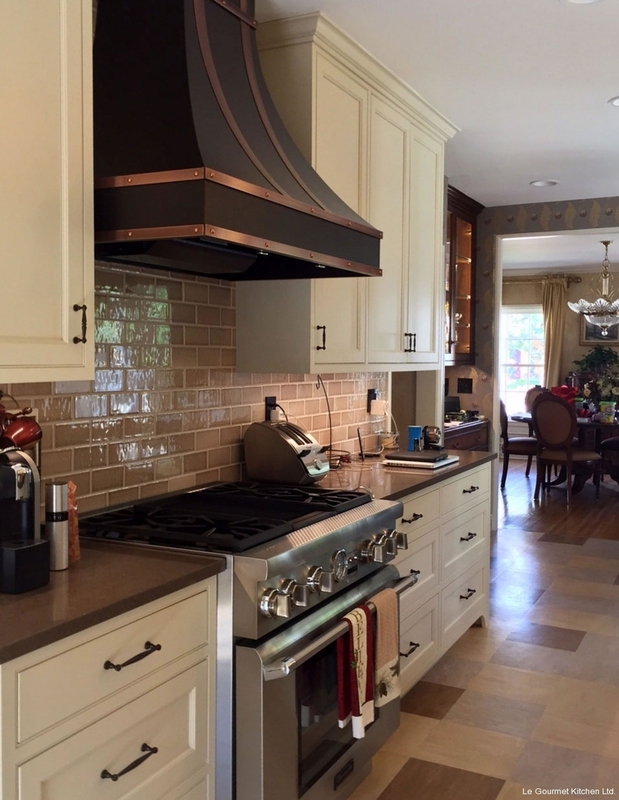 Bruce Colucci the owner of Le Gourmet Kitchen recently helped one of my client finished a kitchen remodeling work. Le Gourmet Kitchen usually handles large scale of luxurious kitchens and this is a tiny investment condo which I am grateful he was willing to help! It was supposed to be a simple remodeling work, but it got complicated with lots of technical difficulties. He solved all the problems along the way, absolutely professional in all situation. We ended up renting the condo in 3 days with multiple offers !